George H. Langeler (center), Dean of Students, who was involved with the administrative response to the Navy and Marine recruiter protests in 1967 and 1969. He is pictured here with two students in about 1970. 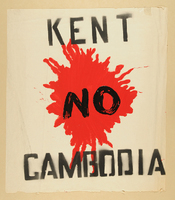 Worn by Anne Kaplan, class of 1973, at the May 1970 Vietnam War protest march in Washington, D.C. 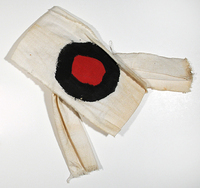 Handmade armband worn by Anne Kaplan, class of 1973, at the May 1970 Vietnam War protest march in Washington, D.C.
Small card with anti-war messages worn by an Oberlin student in the Vietnam War demonstration march in May 1970 in Washington, D.C. 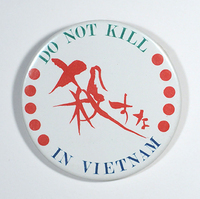 The card was made by the War Resisters League, New York.